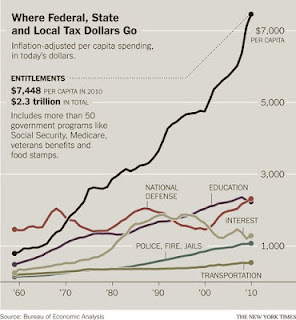 A couple of statistics illustrate why some of the poor (e.g., those active in the Occupy movement) and some of the middle-class (e.g., those active in the Tea Party movement) are angry about federal expenditures. In 2009, federal benefit programs gave the average American a whopping $6,583. Those benefits have increased by 69% since 2000. In some areas of the country, government benefits are 20% ($1 of every 5) of income. Almost half of all Americans lived in households that received government benefits in 2010. Some of the shifting pattern is understandable. Government benefits include those for veterans (more likely to go to the middle class) and all Social Security and Medicare payments (for which almost everyone is eligible). However, the safety net’s purpose in my estimation, and that of many citizens, is to care for the most vulnerable, the poorest, and not to replace reliance on individual initiative and achievement for the majority of people. Several trends in that chart greatly concern me. First, spending on education is decreasing while spending on law enforcement (police, fire, and jails) continues to increase. Putting more people in prison is not the answer to the nation’s fiscal woes (cf. Ethical Musings: Musing about prison). Second, defense spending has increased steadily and sharply since 2000. Yet the world is not safer because of the wars in Iraq or Afghanistan, the principle reason for the increase in defense spending (cf. Ethical Musings: Swords into Plows). 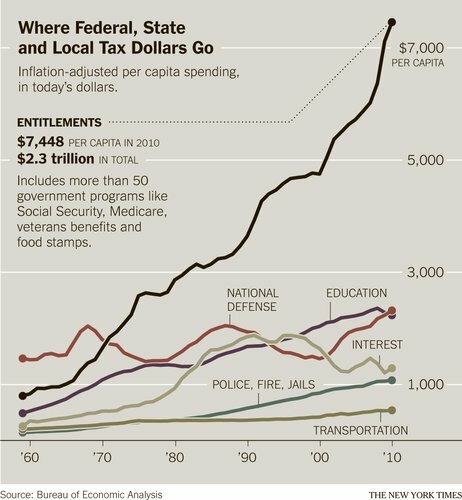 Finally, spending on entitlements has increased more rapidly, far outpacing all other expenditures. The problem of soaring Medicare expenditures is especially troubling. The answer is not to eliminate Medicare, which is probably the most cost-effective means of providing healthcare but to better control healthcare expenditures in total (cf. Ethical Musings: More thoughts on healthcare reform and Ethical Musings: Some events and thoughts worth pondering). Surveys consistently report that a majority of Americans are willing to pay higher taxes but expect the government to practice better fiscal accountability. The huge deficits the nation faces bode ill for the future. This generation is borrowing from future generations to fund its lifestyle, similar to what happened in Greece, Italy, and elsewhere. Exploiting future generations is simply not a Christian approach to obtaining the good things that life has to offer. Perhaps we need to have lower expectations. We certainly need a fairer tax system in which those with the largest income pay a larger proportion in taxes. Eliminating most (if not all) deductions and credits would level the playing field. Having everyone with income pay some percentage in taxes, small or great, would help everyone to feel invested in the nation and its economic system. Thanks for the post. Tangentially, I would quibble with your demographic generalizations for both Tea Party and Occupy movements. I also appreciate your emphasis on providing a social safety net for the most vulnerable among us while emphasizing personal responsibility. I wonder how the accompanying chart would look if we included "corporate welfare." I think that Theodore Roosevelt's example could be helpful when during a recession in the early 20th century he called J.P.Morgan and the Wall St tycoons into his office and made them use their money to fix the problems they created rather than handing out federal bailouts. A lot of the problems and solutions you point out would be well applied to the tycoons, robber barons, and corporations of our day as well.